THIS IS A NEAT COLLECTIBLE! BOTTOM HAS “OUR FAVORITE STINKY CHEESE” AND THE LID HAS HOLT HOWARD’S ADORABLE LITTLE KOZY KITTIES. IN WONDERFUL CONDITION – INTERIOR BOTTOM HAS A TINY (PELLET SIZE) GLAZE CHIP – THAT’S IT! IT DOES NOT HAVE LABEL/STICKER OR MARKINGS. NEAT HOLT HOWARD FLOWER/CANDLE HOLDER FROM THE “LIL-OL-LACE” LINE! MEASURES 3 ¼” TALL AND IS STAMPED ON BOTTOM: 1959, HOLT HOWARD. SHE’S IN WONDERFUL CONDITION – HAS A TEENY DING ON HER CHIN AND ONE ON HER LIP (COULD BE EASILY COLOR TOUCHED-UP). DIFFICULT TO FIND ITEM! 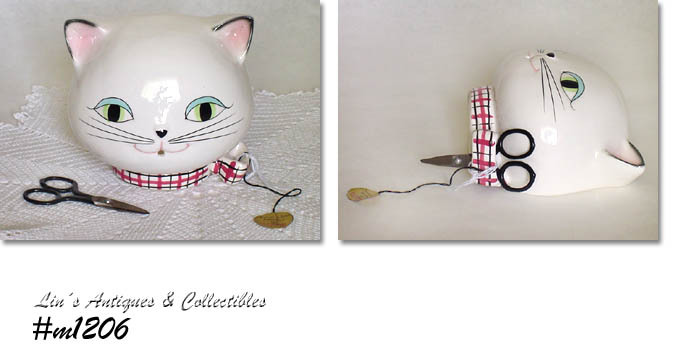 COZY KITTEN ITEMS MADE BY HOLT HOWARD ARE SO CUTE AND THIS ONE IS NO EXCEPTION! IT’S A STRING HOLDER AND IS STAMPED ON BOTTOM: 1958, HOLT HOWARD. IN WONDERFUL CONDITION – HAS A ½” SLICE TYPE CHIP ON BOTTOM DRY RING THAT IS NOT DETRIMENTAL TO USE OR APPEARANCE (SEE PHOTOS). THIS IS A NEAT COLLECTIBLE!! SUPER ITEM -- WHAT A FIND! 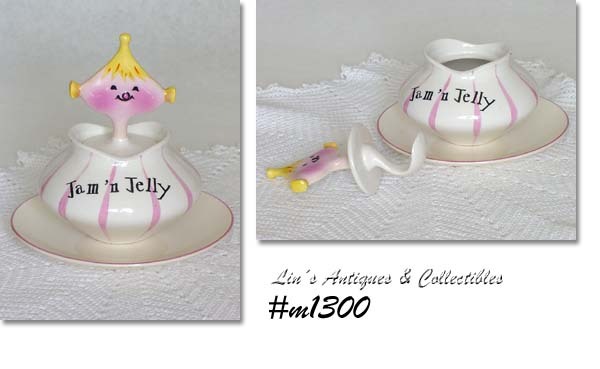 FROM HOLT HOWARD'S VERY COLLECTIBLE PIXIE LINE, THIS IS THE JAM 'N JELLY SERVER. INK STAMP ON BOTTOM: HOLT HOWARD, 1958. THIS SET HAS THE MATCHING SELDOM FOUND SAUCER! 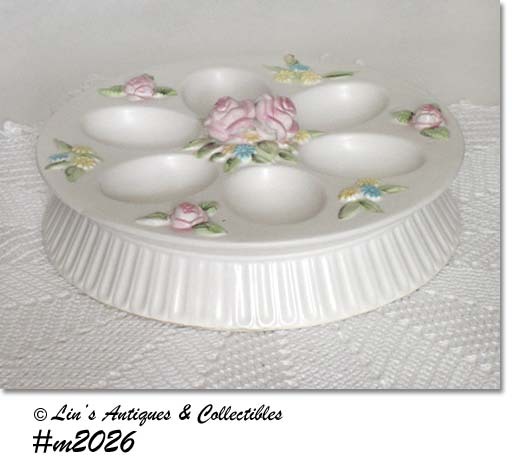 SET IS IN WONDERFUL CONDITION -- HAS LIGHT GLAZE CRAZING. THE ONLY "USE" EVIDENCE IS A 1/4" SUPER TIGHT HAIRLINE ON SAUCER (FROM RIM) -- THAT'S IT! PIXIE HAS GREAT COLORS. 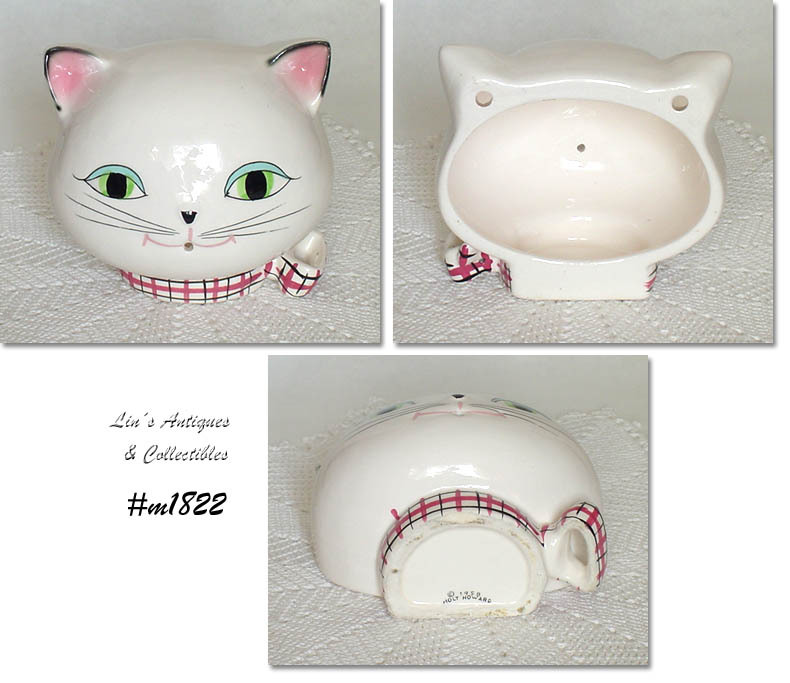 ABSOLUTELY MINT CONDITION COZY KITTEN STRING HOLDER MADE BY HOLT HOWARD! KITTEN HAS PAPER HANG TAG AND THE ORIGINAL LITTLE SCISSORS. STAMPED: 1958, HOLT HOWARD. STILL IN BOX (BOX IS MISSING THE TOP/LID FLAP).WHAT A FIND!! BEAUTIFUL HOLT HOWARD COZY KITTEN ITEM! CALLED A WALL CADDY, HER TAIL IS CURLED TO HOLD A KEY CHAIN AND THERE'S AN OPENING IN TOP OF HER HEAD TO HOLD FLOWERS, PENS, ETC. SHE IS DESIGNED TO HANG ON A WALL BUT IS EQUALLY CUTE ON A DESK. IN EXCELLENT CONDITION -- LOOKS NEW AND UNUSED! STILL HAS ORIGINAL FOIL LABEL BUT CANNOT SEE ANY MARKINGS. A MOST DIFFICULT TO FIND ITEM THAT IS VERY COLLECTIBLE! 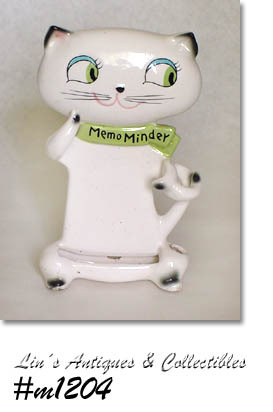 ANOTHER HOLT HOWARD TREASURE -- A COZY KITTEN MEMO MINDER! 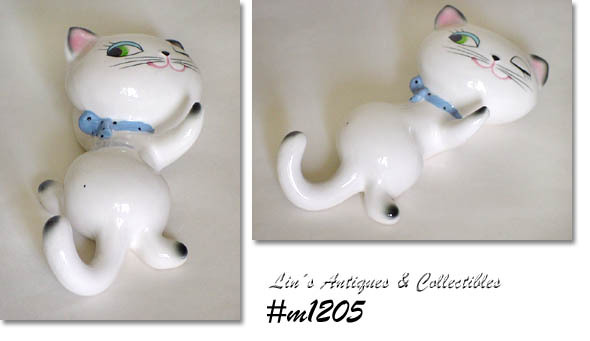 ALTHOUGH DESIGNED TO HANG ON A WALL, KITTEN CAN ALSO BE USED ON A TABLE/DESK. THE END OF HER TAIL IS CURLED TO HOLD A PENCIL. IN EXCELLENT CONDITION -- HAS A 1/8" DING BY ONE HANGING HOLE -- OF NO CONSEQUENCE. STILL HAS HOLT HOWARD PAPER LABEL. EXCEPTIONAL ITEM AND A DIFFICULT FIND! THIS IS A DIFFICULT TO FIND HOLT HOWARD ITEM! DATED 1959, THIS IS THE POWDERED CLEANSER SHAKER FROM THE COZY KITTEN LINE. STAMPED ON BOTTOM: 1959, HOLT HOWARD. 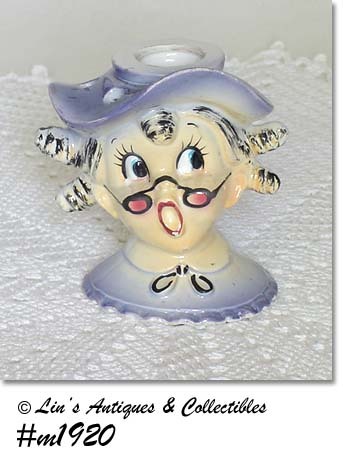 UNLIKE THE OTHER HOLT HOWARD ITEMS WE JUST LISTED, THIS ITEM HAS BEEN USED -- WAS FULL OF CLEANSER WHEN WE PURCHASED HER! SHE HAS A 1/8" DING ON HER BROOM HANDLE AND A 1/4" DING ON ONE EAR. THIS IS A VERY CUTE ITEM THAT IS DIFFICULT TO FIND. ANOTHER BEAUTIFUL HOLT HOWARD SALT AND PEPPER SHAKER SET! DATED 1958, THESE ARE THE LITTLE BUNNIES (ALSO CALLED PEEKING BUNNIES) IN WICKER BASKETS. BUNNIES HAVE GREEN DAISIES, ARE STAMPED HOLT HOWARD, AND HAVE ORIGINAL JAPAN PAPER LABEL. ONE BUNNY HAS A TINY PRODUCTION ROUGH SPOT ON THE EDGE OF ONE EAR -- NOT DETRIMENTAL. SET IS IN MINT, UNUSED CONDITION -- THEY LOOK NEW!